During the Second World War, when the Germans occupied Denmark, Faroes helped feed Britain by sailing there with fish; they sailed under the new Faroese flag called Merkið, which the British officially recognised. There had been a strong movement for independence for many years and in 1946 a referendum was held and the majority chose independence. This caused concern in Denmark and the Danish government dissolved the Parliament. A new Parliament was elected in which there was not a majority for independence. In 1948 the Danish Parliament passed the Home Rule Act making Faroes a self-governing state inside the Danish Kingdom. 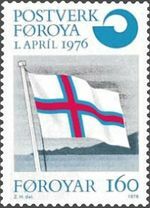 The Act recognised the Faroese flag and the Faroese language. In recent times, the number of people wanting independence for their nation has increased considerably and in 1998 the Parliamentary elections resulted in a coalition taking power whose main promise was to set in motion a process towards full sovereignty. That process is now underway despite changes in the parliament. 25 April is a half-day annual public holiday in the Faroes called Flag Day. It was during the Second World War on 25 April 1940 that there was an announcement on the BBC calling on all Faroese ships to fly the Faroese national flag instead of the Danish flag.